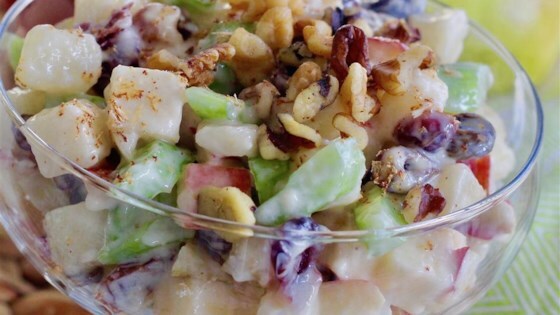 "A festive fall fruit salad made with yogurt instead of the usual mayonnaise." Mix yogurt and brown sugar together in a bowl to make dressing. Combine pear, apple, celery, raisins, cranberries, and walnuts in a bowl. Add dressing and toss well to combine. Sprinkle cinnamon and nutmeg on top. Substitute vanilla yogurt for plain if desired. Wonderful! Added some extra yogurt and a squirt of lemon. I didn’t measure anything. I used vanilla yogurt and real mayo, brown sugar, and a dash of cinnamon. I also added some slice red grapes. This was delicious! !